Hillary Clinton has been out on the town these past two evenings. Daily Mail reports Hillary sightings and celeb encounters Tuesday and Wednesday night in NYC. 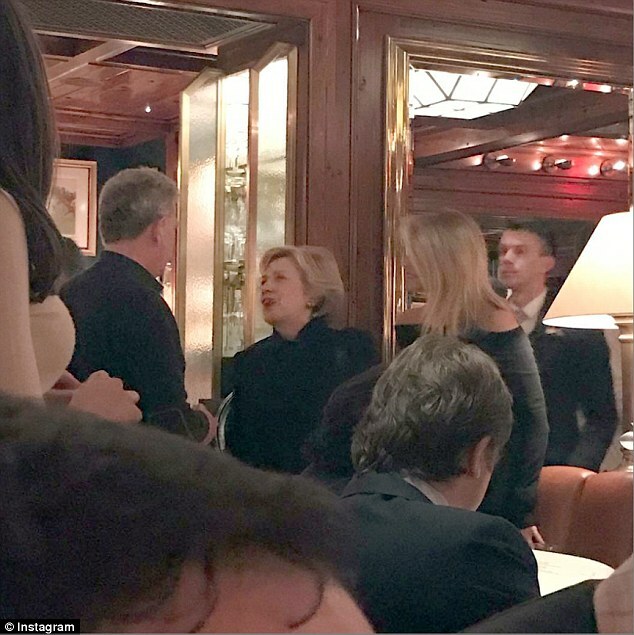 Hillary Clinton was spotted Wednesday evening dining at Ralph Lauren’s exclusive New York City restaurant The Polo Bar as she is seemingly enjoying life away from the White House. Clinton was photographed inside the famed eatery and arguably one of the most difficult places to get a table while speaking to model Christie Brinkley. This is the second time this week, the 69-year-old was spotted out, as she posed for a picture with popular rapper Fat Joe on Tuesday inside iconic Italian restaurant Rao’s. On a more personal note, Dianne Feinstein reported whisking Hillary out of the public spotlight in D.C. last week for an intimate dinner and said Hillary is still smarting, not just from the loss but from the grueling, vitriolic campaign itself. We all knew when she got in that it was going to be hell-on-wheels for her. It was prolonged and sustained and the wounds are deep. Hillary Clinton holds her head up high in public, as always, and is our strong courageous leader. We are still with you, Hillary. We love you. We know how hard you fought to bring the issues to the table amid all the garbage they were throwing at you. You are our hero and always will be. Enjoy Hillary. Have fun and God Bless. Merry Christmas. Hillary was subjected to horrific verbal and emotional abuse that went far beyond anything any male candidate has ever endured. It was not just “hardball politics”. It was abusive and began with the media which signaled this would be acceptable against this particular candidate. Now there are some calling on Hillary to do more to stop Trump. How ironic! Hillary left it all out on the field trying to stop a fascist takeover by Putin and Trump. She was not and is not president. That job still belongs to Barrack Obama. Requests for action should be directed at him–not that there’s any reason to hope that he will do anything ever about it. Like America itself, Hillary is the victim in this and should not be expected to subject herself to further abuse. However, history will be kind to her, unlike almost everyone else in this sordid tale. She is and always will be seen as heroic–for enduring with grace and dignity while winning 3 million more votes than Putin’s puppet.